Columbia Town Hall is located at 103 Main Street, Columbia NC 27925; phone: 252-796-2781. Photo: View of Albemarle Sound near Columbia, 2005, Ingrid Lemme, photographer, en.wikipedia.org, accessed February, 2012. The town of Columbia—known originally as Elizabeth Town—was chartered by the North Carolina General Assembly in 1793, although settlement of the area in and around the present town boundaries began much earlier. Between 1793 and 1802, the town was laid off on the east side of the estuary of the Scuppernong River at a place called Shallop's Landing and the first lots were sold. In 1799 the town was selected as the seat of Tyrrell County, which was established in 1729 as a precinct of Albemarle County. A year later Thomas Hoskins and Zebedee Hassel sold the county a one-acre lot in the town for the construction of a courthouse and other public buildings. This "public ground," as it was known, was inclined ten degrees off of compass orientation—the present inclination of the streets in the historic center of town—and it measured 165' by 264' in size, roughly corresponding in size to the present courthouse lot in the center of Columbia. Early deeds refer to a street leading from the public ground to the river—either present-day Main Street or Bridge Street—and an intersecting street—possibly the present Broad Street. Other, more enigmatic early references are to "the old field of Columbia," "the third row of lots from the lane running back from the water," and "the hurrying place containing sixteen feet by sixteen feet." The name of the town was changed from Elizabeth Town to Columbia in 1810, apparently to avoid confusion with another Elizabethtown in North Carolina. 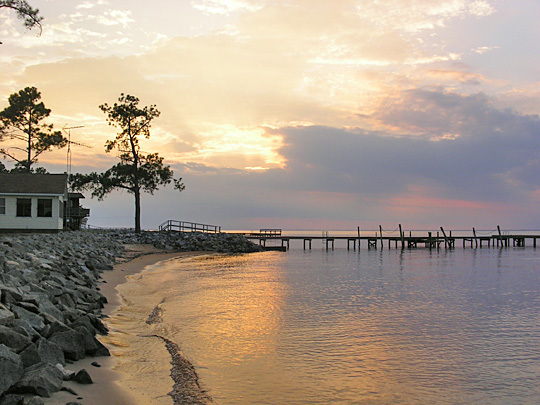 For the remainder of the antebellum period, Columbia led a languid existence as the seat of a sparsely populated county and as a service and trade center for a large hinterland on the south shore of the Albemarle Sound. Trade and lodging associated with the activities of the county court probably formed the economic basis of the town. The 1850 Federal census of population, the first to list occupation and other statistics for individuals, suggests that virtually the entire cadre of professionals and tradesmen in the town lived in a single residence—the tavern of J. F. Davenport. With Davenport lived William D. Carstarphen, a leading merchant during the late antebellum and early postbellum periods; three other merchants, three lawyers, five carpenters, two physicians, two blacksmiths, and a peddler. Whether this population boarded in a single large building or whether the individuals lived and worked in a complex of separate buildings owned by Davenport is unknown. Black slaves and possibly free blacks almost certainly lived in town; J. F. Davenport, for example, was a slaveholder. County officials such as the clerk of court, sheriff, and constable lived on farms outside the town. J. Daniel Pezzoni, Preservation Technologies, Inc., Columbia Historic District, Tyrrell County, NC, nomination document, 1993, National Park Service, National Register of Historic Places, Washington, D.C.